It never fails. Every year as soon as we have a couple of warm days in late winter, the idiots of spring bloom. People who have not thought about fishing since las spring suddenly decide to go catch fish, and do things that are either inconsiderate or stupid, or both. Trying to put a boat in at a popular ramp is a joke. In our club tournaments we can launch ten boats in a few minutes and get out of the way. We know better than to back down to the ramp, block others from it and spend 20 minutes unloading stuff from the truck taking straps and hooks off the boat and trying to get everything ready. That is done in the parking lot well away from the ramp. And most of us can back a trailer into the water efficiently, not having to pull up and back up a dozen times to finally get it in. A double ramp is just that, room for two boats to launch at the same time. The line down the middle is there to divide the ramp, not to aim at and straddle! At the Sportsman Club tournament two weeks ago, I pulled up at Dennis Station ramp on Lake Sinclair at 7:00 AM just as it got light. Two club members were already there, trying to maneuver their trailers around a truck that was sitting right in the middle of the area used to back up to the ramp, with lights on, motor running and boat on trailer not many feet from the water. They got their boats launched and parked their trucks and came over to pay their entry fees. One said there was a guy sitting in the running truck. We did not know whether he was asleep, passed out or dead. I was nervous about knocking on his window to see but one brave club member did so. The guy woke, pulled up into the parking lot out of the way, sat there a few more minutes then drove off without getting out of his truck. I still have no idea what he was doing, but he was sitting there for at least 30 minutes while I was there. Maybe he fished all night while enjoying adult beverages and could not make it any further! If you head to the lake this year be considerate. Get your boat loaded and stuff ready to go out while in the parking lot. Try to back into the water, launch your boat and get out of the way. Don’t be a blooming idiot this year! This entry was posted in fishing basics, Fishing Humor on February 15, 2018 by ronniegarrison. I have spent all my life training to be grumpy old man, and I think I have achieved my goal! More and more I get irritated at things I consider silly or stupid. One of my pet peeves are the crazy names some fishermen call big bass and other terms they use. Recently I made another fisherman mad because of my response to him. He said they “slayed” them while bass fishing. I responded that most bass fisherman let bass go, especially the bigger ones. He got all upset saying they let everything they caught that day go. When I pointed out “slaying” means killing, he quit talking to me. Some terms have been around so long I guess I have gotten used to them. Calling a big bass a “gorilla,” usually pronounced “go-rilla,” has been common for years. And terms like “pig” or “hawg” make me think of bacon rather than bass, but I hear them all the time. When I talk about big bass I usually use the term “the one that got away.” There have been several times when I fought a bass for long time and called it a catfish when I landed it. I have also called big bass “sticks,” “logs,” and “rocks” soon after setting the hook. All sports have terms specific to them. But I’m not sure most have as many as fishing. This entry was posted in Fishing Humor, Fishing Ramblings - My Fishing Blog on January 6, 2017 by ronniegarrison. Corn meal – gotta be White Lily! Make sure beer is cold by drinking one. Then put fish filets in a big bowl and drink another beer to insure it is still cold. Pour cornmeal over fish filets – don’t really matter how much. Drink another beer to insure quality is not deteriorating! Pour half or less of a beer into bowl, drink the rset. Sturr the cornmeal and vbeer and fishes around and around. Open a frash rebar and varry carefullily drop on drop of it into oil. If it explodes it is too hot so turn it down while drinking the reset of the reber. While the erl cools, drink another bar and sturr the fish again to make suer the crnmoal is all over it. Look at the arl – is it smaking? If it is it probably amks you swat a smoke, so get one shile drnking another reeeber. This entry was posted in Fishing Humor on February 10, 2016 by ronniegarrison. Summertime fishing during my pre-teen years was always fantastic – whether I caught anything or not. From fishing for tiny cats and bream in the branch below my house to riding my bicycle to local farm ponds to try to catch bass, I fished almost every day. Dearing branch provided some of my early learning experiences about fish behavior. When we were not damming it up or swimming in it, we fished. In a small branch you get up close and personal with the fish. I could watch how they used stumps, limbs in the water, current and other structure to hide and get food. Fish in big lakes act much the same way, just on a large scale. And hopefully, the fish are larger also! I made my own “flies” for fishing the branch. It was quite a thrill the first time I got a six inch branch minnow to hit one of my creations of chicken feathers and sewing thread. I am sure the action of making it vibrate on the top of the water like a fallen insect was more important than the way it looked, but it worked. I thought I was really an artist, but found I needed bought lures to catch bass, my favorite. To this day my bass boat is loaded with way more tackle than a dozen people could use in a week. One of my first tackle boxes – and I still have it – was a huge Old Pal box about two feet long. My folks got me a basket for my bicycle one Christmas and had to look all over Augusta to find one big enough to hold my tackle box. With my tackle box in the basket and my rod and reel across the handlebars, I was ready to go to any pond within three or four miles. If I caught any fish they dangled on a stringer from one handlebar on the way home. I hardly ever went alone, my two friends and I traveled in a pack when we went fishing. That added to the fun. I always had a few hooks, some line and a couple of sinkers and corks in a little box in my pocket. With my trusty – or maybe rusty – pocket knife I could cut a limb and be fishing in minutes. If there was a cane patch nearby I was in heaven with a real cane pole! One summer my folks rented a cabin at Vogel State Park for a week. I could not wait to get to the clear mountain stream full of trout and try out my flies. I was eight years old and I knew those rainbows I had read about would just eat up my creation. How wrong I was! After a couple of fruitless days of fishing the stream in front of the cabin and catching nothing, even with the live worms I had given in and tried, I decided the lake a mile or so downstream was where the fish were hiding. I also thought I needed to be there at the crack of dawn to catch them. I swear I told my folks I was going fishing early the next morning. I think they just didn’t remember with all the vacation excitement, but they were quite relieved when they found me mid-morning, sitting on a rental boat tied to the bank at the marina, catching tiny bream and bass on my earthworms and cut pole. I had gotten up before anyone else and walked to the lake to fish. My parents found me when they asked a couple of teenage girls out walking around if they had seen a lost child. They told them of the “Huckleberry Finn” they had seen – barefoot but wearing a straw hat, sitting on the boat with a tree branch pole catching fish. They didn’t get too mad. As a matter of fact, my mom told me years later that she didn’t worry about me as long as I was fishing. She thought a guardian angel watched over kids out trying to catch fish. They let me grow up pretty wild, and I thank them for it. This entry was posted in Fishing Humor, Fishing Ramblings - My Fishing Blog, Fishing With Family and Friends on November 2, 2014 by ronniegarrison. When you first realize you aren’t tucked in your own bed, your next waking sensation is the smell of canvas. Anyone who has ever camped in their back yard as a kid will never forget that smell. It meant adventure, freedom, fear and many other emotions all rolled into one. From the old army surplus pup tents to fancy Sears tents with floors, I spent many happy nights in them. Camping out was one of the rites of summer while I was growing up. We organized our overnight stays as well as any expedition to climb Mt. Everest. Each of us had specific things to bring for the group, and each one of us also had their own private treasures. We brought so much stuff we could not have carried it further than our back yards. Mess kits and matches were all we needed to cook our breakfast of bacon, eggs and toast over an open fire. The bacon was always half burned and half rubbery undercooked, but all delicious. Toast, as soon as it turned a perfect golden brown, was either dropped into the fire or left a little longer to blacken. Eggs stuck to the pan and had to be scraped off as they were eaten. For supper, we discovered “hobo meals” at church camp. A hamburger patty was placed on a square of tin foil, sliced potatoes, carrots and onion stacked on top of it and all was topped with a hunk of butter. Sealed up and cooked on the campfire coals, it was moist and tender, I was told, if you didn’t stick a hole in the tinfoil while cooking it. I never had one cooked that way. Mine always managed to get stuck. For desert we always had somemores. They were graham crackers with a Hershey bar and a toasted marshmallow on top. We go more on our hands and face than in our mouth, but they were still great, and you could lick for a long time and make the flavor last. Sleeping was also an adventure. Each of us boys had our sleeping bags, which we placed directly on the ground for years. We got used to scrounging around until we got comfortable on the rocks and limbs we didn’t remove before spreading the bag out. Then one of us got an air mattress. What a joke. I do not remember even one that was still inflated shortly after blowing it up. We tried every time though. Once we got the bright idea of sleeping on a lawn lounge chair. That worked if you didn’t mind the bar across your back all night long. And it was tough to roll over in your bag in the chair. We used them often, though. They were still better than the ground. Something else I will never forget is the way your voice sounded when waking up early in a tent. Maybe it was the lack of sleep, maybe it was the tent itself, but we always sounded funny to each other and ourselves. We never camped more than one night during the weekend because we needed the other night to recover! Sometimes I think I would like to do that kind of camping again. Then I remember how much I ache getting out of a nice soft bed in the morning and realize backyard camping is best left to the young! This entry was posted in Fishing Humor, Fishing Ramblings - My Fishing Blog, Fishing With Family and Friends on October 31, 2014 by ronniegarrison. Sometimes the old saying “If it wasn’t for bad luck I would not have any luck at all” seems to apply to my fishing trips. After looking forward all year to the three club tournament at Lake Martin a few years ago, the trip week before last certainly had its ups and downs. When I got to Wind Creek State Park Wednesday afternoon I was lucky enough to get a campsite on the water. There were 500 FEMA trailers set up in the campground, leaving 120 sites for visitors. I got my boat in the water, set up my van for camping and went out riding around for a couple of hours. Back at the campsite I was scraping glue off a plug and my knife point slipped, sticking into my thumb deep enough to draw blood. Thursday morning I got up and headed to a favorite spot to check it out. I hooked three bass on three casts and left, planning on starting at that spot in the tournament. Unfortunately, when I stopped across the river at another spot I heard a boat crank up at a dock near where I had left. They went straight to “my” spot and I watched them catching bass and putting them in their ice chest. I am not sure if they saw me catching fish, but for the next three days that boat was on that spot every time I went past. 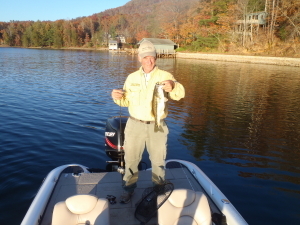 I fished for a couple of hours and landed a good many bass, so I was pleased with the results. At noon I stopped on a spot I wanted to fish, put the trolling motor in the water and picked up a rod. The line on the rod I picked up caught the handle of another reel and flipped it into the lake. I reacted rather than thinking and grabbed for the rod – and fell out of the boat. I remember still grabbing for the rod as I went under, then coming to the top and reaching for the boat. This was the first time I ever fell out of a boat in all my years in them. I tried to hold the side of my boat but I was wearing jeans and tennis shoes, and as soon as I stopped paddling with my hands I started sinking. The boat sides were slick and I could not hold on. I started to panic, not knowing what to do. All the stories of fishermen drowning flashed through my mind. Somehow I managed to get to the motor of the boat and pull myself in, using it as a ladder. Once in the boat I threw out a marker, what I should have done as soon as the rod went overboard. By now the boat had drifted so I realized my chances of snagging the rod were slim. Then I remembered my sunglasses – my prescription bifocal sunglasses. My $300 glasses were on the bottom of the lake with my $200 rod and reel. That was quite a mistake! The rest of the day was uneventful and I was lucky to be alive. Friday morning I went to a point and got seven bites real quick, so I had a good place to start. In other places I landed a lot of bass. One of them flipped as I tried to take it off the plug and drove a hook past the barb into my thumb. I finally got it off the plug and pulled the hook out with a pair of pliers. Saturday morning I quickly landed my limit of small bass and headed up to the place I had lost my rod and glasses, hoping for one bite from a big bass. I got it at 2:30 PM, the fish slapped at a buzzbait and missed then sucked in a jig and pig. I fought the fish out of the tree it was in to clear water and it jumped. My heart jumped, too, the fish was a good six pound bass, just the one I wanted. Then my jig flew out of its mouth. I almost had another rod and reel at the bottom of the lake but I stopped myself from throwing it in. Sunday morning the second bass I caught shook as I took it off the plug but I got it into the livewell. While fishing my hand slipped on the reel handle and I looked down to see blood everywhere. Something had ripped a hunk of meat out of my finger while I unhooked that fish. I tried hard, but only caught five bass that day. At least nothing else got hurt and I made it home in one piece. Right now I have Band-Aids on three fingers and memories of the big one that got away, but I feel more safe sitting at my desk! Javin English won the tournament with 13 bass weighing 17.04 pounds. Lee Hancodk had 10 bass weighing 15.49 for second, and his big one did not get away. It got big fish honors at 6.12 pounds. Tommy Reeves was third with 11 bass weighing 15.47, Billy Roberts was fourth with 12 weighing 14.83, I was fifth with 12 weighing 13.74 and Ronnie Gregory rounded out the top six with 12 at 13.14. I am already looking forward to the trip to Martin next fall! This entry was posted in Bass Fishing, Fishing Humor, Fishing Ramblings - My Fishing Blog on July 3, 2014 by ronniegarrison. What Is Some Fishing Terminology? Every sport seems to have its own terms and often someone not familiar will be lost when listening to two or more fanatics about the sport talking. Fishing is like that. A lot of the terms may have more than one meaning and not be related to real life. When you hear someone say they lost the big one or the big one got away, they are talking about losing a big fish. In bass fishing it is common to hear something like “It woulda weighed at least eight pounds but it got off before I saw it. What that means is they hooked a fish, no matter how briefly, and it pulled. If they say they saw it or it got off at the boat and still say it weighed eight pounds it probably was a bigger bass, and might have weighed three pounds. The big one always gets away! If a fisherman says he hooked a big bass but it wrapped him up and broke him off it means a his lure hit a stump, he set the hook and thought the stump was pulling back, then realized he was hung. But he is sure it was a big bass. Bragging about the speed of a bass boat is common. GPS devices have cut out some of that. In the past boat speedometers were notoriously inaccurate. I have passed boats and was told I was flying – the guy I passed says he was running 75 mph. But my GPS showed 55 when I went by him. If someone tells you they brought home 100 crappie, they may have. But they were breaking the law if they did, and cleaning 20 crappie often seems like you cleaned 100. Pictures never lie but they can be very misleading. If someone shows you a picture of a bass and says it weighed five pounds, look at their arm. If it is extended away from the body it makes the fish look much bigger. Perspective is an amazing thing. And check out their thumb in the mouth of the fish. If the thumb fills up the mouth of the fish either they are the Jolly Green Giant or the fish didn’t come close to the five pound mark. I often hear the comment “remember that tournament when I got the ten pounder but three other people beat me for big fish,” or “I remember weighing in five bass weighing 22 pounds at Oconee back in 75. Problem is, I have all the club tournament records going back to the early 1970s. Lake Oconee was not built in 1975. But in 1985 he had his best catch ever, ten bass weighing 12 pounds. And all those ten pounders turn into five pounders when I look back at the results. Written records are a such a downer. One time my partner broke his rod setting the hook. He went on and on about a factory defect. But I had just seen him crack the rod against the side of the boat when working a topwater bait, and it broke exactly where his rod hit the boat. In one tournament I was told the fisherman ran 70 miles up Little River to fish a hotspot. Problem is, Little River is only 30 miles from the dam to the upper end. Maybe he got lost and went in circles! Bass get on “patterns” and if you can figure out what they are feeding on, the depth they are holding and the type cover they are on that day you can usually catch more doing the same thing. But I am always amazed when someone tells me, after catching one 11 inch bass, that they are all 10 feet deep on stumps feeding on morning glory colored worms. Look at this rod I got at a yard sale for only $100 – what a deal. I had to bargain for it for 15 minutes. Its a $300 rod! OK, that company does make a $300 rod, but that series sells new for $80. Yep, a real steal. Fishermen are always looking for an excuse. If one person in the boat is catching bass on a color of worm and his partner doesn’t have that exact color, he wants one. And often still doesn’t catch fish. He didn’t notice the one catching the fish was using eight pound line while he was using 20, his sinker is three times as heavy as the one catching fish, and his cast are hitting 30 feet to the right of the brush pile. And the one catching fish is jiggling his rod tip to make the worm dance in one spot while the one not getting bites is dragging his worm, the same color sure, but moving it two feet with every pull. But the worm color is what is different! The comment “This line is no good, it broke again” is heard all too often. And some line seems to break too easily and does deteriorate over time. But if the fisherman says he hasn’t changed his line in two years, that is the problem, not the line. All too often I look at the “broken” line and there is a little curl on the end. Guess what? Your knot slipped and camee out. The line didn’t break, it was operator error! Take everything a fisherman says with a grain of salt. Or maybe a 50 pound bag of salt. We do tend to get carried away with what we think we know, even if the other person knows what we are talking about! This entry was posted in Fishing Humor on May 28, 2014 by ronniegarrison. How Big Was That Fish? There is a lot of truth to that definition! Bass fishermen are terrible about estimating the weight of their catch, most of the time. I will never forget a tournament a few years ago at Oconee. I had five in the live well at about noon and I was real happy since I guessed they averaged about two pounds each. A fellow club member stopped to talk and said he had a limit of three pounders. That made me think my catch was not so great. But at weigh in my five weighed 10.4 pounds and his five “three pounders” weighed 9.1 pounds. The bigger the fish gets the faster the difference between its real and guessed weight seems to grow. It is not unusual at a tournament for a fisherman to come in and say he has broken our big fish pot, only to find out the fish weighs less than five pounds when taken out of the live well. It would seem the pros could estimate the weight of their fish more accurately, but I am not sure. During the Bassmasters Classic the observers have phones and text in the weight of each bass the pro they are with lands during the day. A score card is kept on the BASS internet site that tracks their catches during the day. Many of the days during the last Classic it was no where near accurate. Supposedly the pro tells the observer how much his fish weighs and that is what is sent in. So it may be some of the pros intentionally try to play mind games by over or underestimating the weight of their fish. And it is possible the people running the tournament fudge the numbers to keep it more interesting. Just like in a blowout in football, like this year’s Super Bowl, if it isn’t close it is less interesting. So to make people want to watch the live weigh-in at the Classic, they may try to keep it looking close to keep up interest. I have been very guilty of overestimating my bass’s weight at times. On a trip to West Point the last day of February a few years aqo I hooked the biggest bass I had hooked in a long time. When I got it in the boat I was sure it would weigh at least ten pounds, but when put on my digital scales it showed 7.6 pounds. A nice fish but no ten pounder. Those digital scales can really deflate a fish – and your ego. Smaller fish can fool you, too. I don’t know how many times in tournaments I have had a limit of bass, especially spots, and think they will average a pound and a half each, or around 7.5 pounds for the limit, only to find they weigh six pounds or less on the scales. Spots often weigh less than largemouth the same length since they tend to be thinner. In a Sinclair January tournament way back in the 1970s we had really tough fishing. Only four keepers were brought to the scales. My fish was the last to be weighted and I just knew I had won and got big fish since the first three weighed 12, 13 and 14 ounces. My fish looked bigger. It weighed 11 ounces. I think it is the lightest fish ever weighed in during a tournament! Crappie fishermen are just as bad or worse then bass fishermen. I have been told many times a fisherman had a bunch of two pound crappie, but then their biggest fish of the bunch weighs less than a pound. A two pound crappie is a really big crappie. Bream are the same way. A one pound bluegill is a really nice size fish but I have been told a lot of times fish weighing less than a pound weighed over two pounds in the telling. My biggest bluegill ever weighed one pound, twelve ounces, on digital scales, and it was huge. Catfish grow huge, with some blue and flathead cats weighing over 100 pounds. But those fish are rare. Usually the tale I hear is that they caught a catfish so big when held up at shoulder height its tail dragged the ground. Such cats are caught, but if it was really that big it would be really hard to hold it at shoulder height. When a fisherman tells you about his big catch, remember to allow for the growth from the time it was caught until when he tells you about it. Someday I hope to catch a fish so big I don’t even have to exaggerate about its size. This entry was posted in Bass Fishing, Fishing Humor on March 19, 2014 by ronniegarrison. I should have killed the yellow jackets in the nest at my dock faster. A few days ago when I went to the farm and when I got near the dock I would see the yellow jackets flying around their hole. I really didn’t think it was a problem and went out on the dock to fish. I guess my dog Rip was attracted to the noise, or he just stepped in the wrong place. I heard him “yip” and when I looked at him his black coat was half yellow. He was furiously pawing at his face and scratching. When I yelled at him he finally came to me on the dock. Unfortunately, he brought the yellow jackets with him. I grabbed Rip and threw him in the water, which helped him but left many of the swarm of mad yellow jackets with me. They started stinging me and I took my cell phone and wallet out of my pocket and got ready to jump in the pond myself. I guess I knocked enough of them off me and killed them that they stopped. I noticed the bream were having a feast on the bugs in the water when I realized Rip had gone back to the bank, right at the nest, and was covered with them again. Rip hates swimming and often will not come near me on the dock. I think he remembers past trips when I helped him into the water to cool off. Anyway, this time he came running to me, like he realize getting in the water helped. I threw him in again and, again got some stings before I could kill the ones around me. When I looked for Rip he had swam to the bank and was sitting in the water up to his neck. He knew staying in the water protected him this time. When I got him and eased around the nest I noticed something had been digging at it. The next day I went back with a drink of gasoline for the striped stingers but they were gone. There was a much bigger hole and parts of the nest were on the dock where something had dug it up and ate the larvae. The rest of the bugs went away. Raccoons and skunks will dig up nest like that. I guess the meal is worth the pain, or their furry coats protect them. I wonder if armadillos will dig them up, too. The armor plating on a possum on the half shell should protect them from the stings. No matter what dug them up, I am glad they are gone! This entry was posted in Fishing Humor, Fishing Ramblings - My Fishing Blog, Fishing With Family and Friends on October 25, 2013 by ronniegarrison.